Senior infielder David Hensley takes a hack during the Aztecs 7-0 victory over Fresno State on April 22 at Tony Gwynn Stadium. 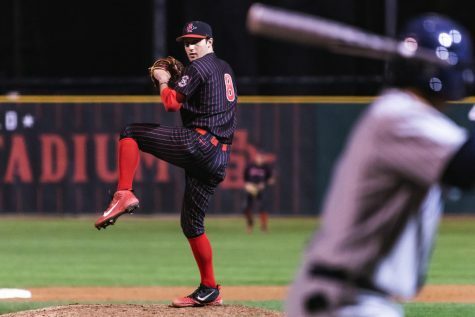 San Diego State baseball captured its weekend series, beating Fresno State University 7-0 after scoring in four consecutive innings Sunday afternoon at Tony Gwynn stadium. 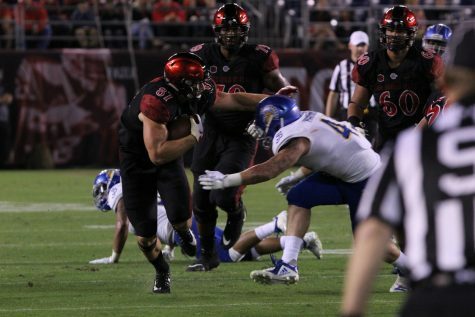 SDSU improved its record to 26-14 on the season with the victory, while the Bulldogs drop to 23-16. 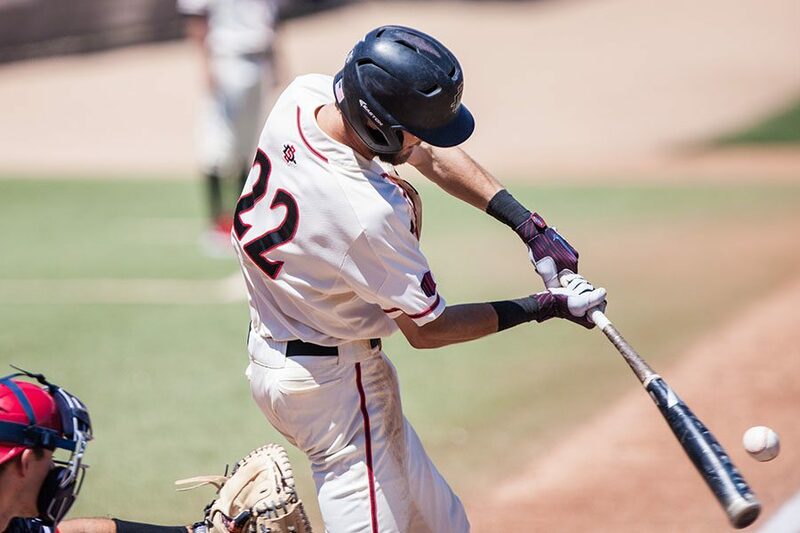 The Aztec scoring got started in the fourth inning, after junior first basemen Jordan Verdon led off the frame with his sixth home run of the season to give the team a 1-0 advantage. 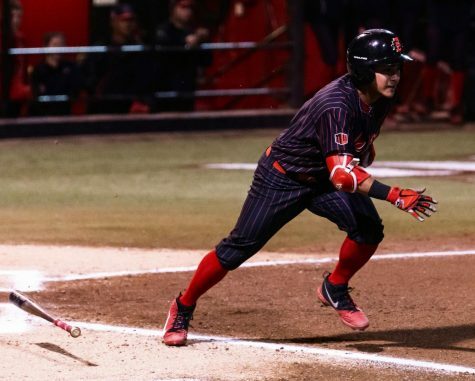 The following inning the Aztecs grabbed another run after sophomore second baseman Jacob Maekawa led the fifth inning off with a single, before a one out bunt by freshman outfielder Matt Rudick advanced Maekawa to second base. 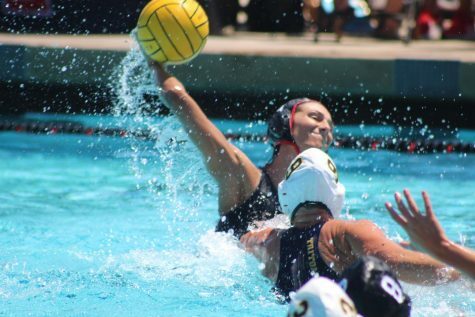 After the bunt, senior outfielder Chase Calabuig laced a two-out single up the middle to drive in Maekawa from second base and make the score 2-0. The Aztecs scored again in the sixth, after a three-run home run by junior designated hitter Chad Bible. Before the scoring concluded in the seventh inning, a bases loaded two-RBI single by junior catcher Dean Nevarez extended SDSU’s lead to 7-0. 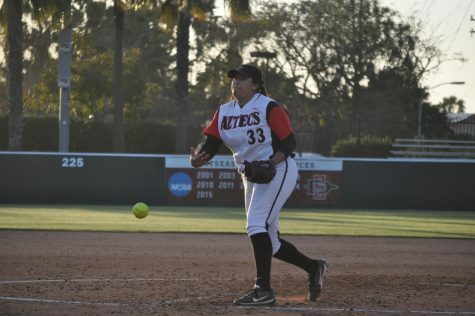 The seven-run cushion was more than enough for the Aztecs pitching staff to complete the win. 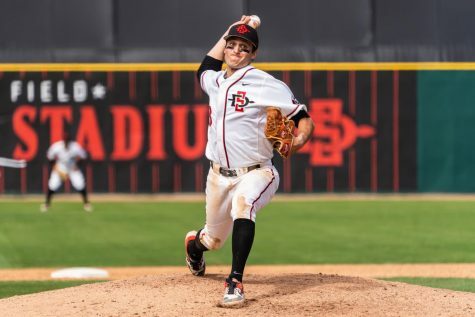 The Aztecs pitching staff threw its first shutout of the season, with six innings of the work coming from senior pitcher Jorge Fernandez (4-3). Fernandez was starting just his second game of the season, and went six innings while allowing four hits and striking out seven. Fresno freshman starting pitcher Jaime Arias was pegged with his first loss on the year, after pitching 5.1 innings and giving up seven hits, four runs (three earned) and striking out three. Following Fernandez six innings, senior pitcher Jacob Erickson came on and delivered two scoreless innings, before senior pitcher Ray Lambert closed the door on the win. 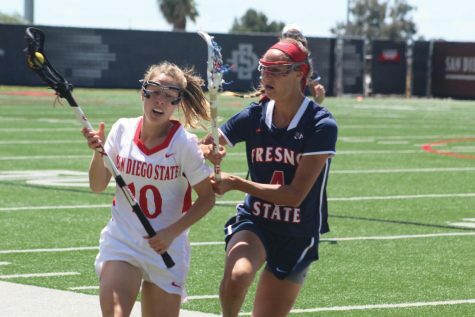 The Aztecs now stand alone in second place in the Mountain West Conference standings, as the team heads into another weekend of conference play next week. 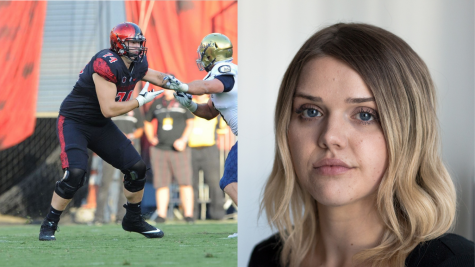 SDSU will look to keep the good times rolling against University of Nevada, Las Vegas, which the team welcomes in for a three-game set starting April 26 at Tony Gwynn Stadium.